(Newser) – For a retired speaker of the House, John Boehner has had a lot to say lately. Over the past couple of weeks, he's likened Ted Cruz to Lucifer and bragged about the House GOP's victory against ObamaCare, and now he's moved on to his next target: Hillary Clinton. Speaking Thursday at the SALT investment conference in Las Vegas, Boehner touched on the FBI's probe into Clinton's private email server and made mention of a possible alternative for the Democrats if Clinton has to drop out of the presidential race, the Hill reports. "Boehner says he 'would not be surprised at all' if Clinton 'has to withdraw' and [Joe] Biden 'parachutes in,'" tweeted CNN correspondent Phil Mattingly, whose Twitter timeline was filled with plenty of other juicy Boehner quotes from the SALT speech. 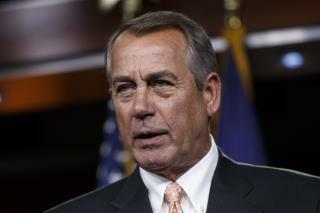 With all Boehner's supposed knowledge of who should be President couldn't find 1 republican to compete with Obama, Twice. This election makes 3 failed times to find a candidate. Boehner broke Regan's number 1 *commandment when he crapped on Cruz. I don't like Cruz, at all, but Boehner should have found better words to use than the Devil. Thank God we don't have to EVER worry about President Obama represent anyone like that. * The commandment was given as such: The party of crap should never crap on its own crap, least people realize they truly are the party of crap.